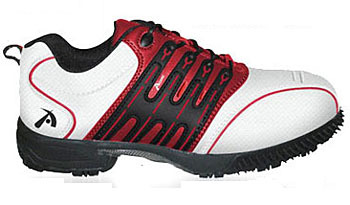 "Brisole Regal Golf Shoes Brisole Technology has been designed into the sole to assist the player in removing lightweight debris, grass and mud from the club face of your irons or other clubs when necessary. Perfect for use when away from your cart and while in play on the course or on the driving range when multiple shots are occurring requiring a quick light cleaning. Each person will find the most effective way to utilize the bristles Features • Upper: Embossed Textured Leather • Outsole: Rubber/Phylon • Comfort: Premium Gel Comfort Insole • Waterproofing: 1 year Enhanced • Cleats: Q-loc Stinger • Dintex: Inner Comfort Liner How to: Option 1: When in your shot stance after a practice shot, to clean your club-face simply: Open the club face and position it at the side of your foot beside the bristles on your shoe. Simply raise the toe of your foot slightly and push the club-face against the angled bristles. Using motion, Slowly slide the club-face up and back against the bristles to remove the debris. Repeat this step if needed until debris is removed to satisfaction. Practice will help create the most effective use of Brisole Technology because each player is different and will discover there are many ways to use the bristles in their own style. Option 2: Put your club-face on the ground face-open in stationary position as shown. Take your foot, raise and tilt bristles toward the club face. Using the bristles, brush off debris until debris is removed using forward, up and down motion with foot. Brisole Technology is designed for quick and lightweight cleaning only. It is not meant for deep cleaning the grooves of the club face, only a means to clear debris so that a shot can be performed unabated while on course or at the range when a towel or brush is not available."